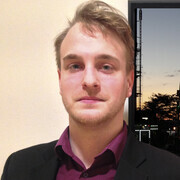 Giorgio de Chirico and Francesco Vezzoli both have personalities that are and were, at times brash, but nonetheless enticingly enigmatic. 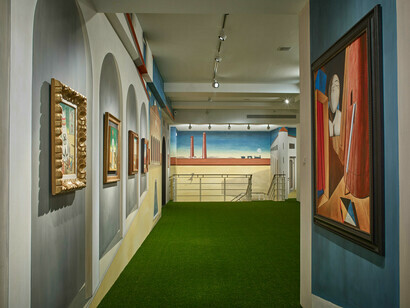 More importantly, it is this that seamlessly blends their art to their lives and was the subject of Metafisica da Giardino at Nahmad Projects, London, a small but lively overview of de Chirico’s career curated by Vezzoli. In it Vezzoli includes his own work in a witty re-examination of one of Italy’s foremost modern masters through the eyes of one it’s leading contemporary masters. 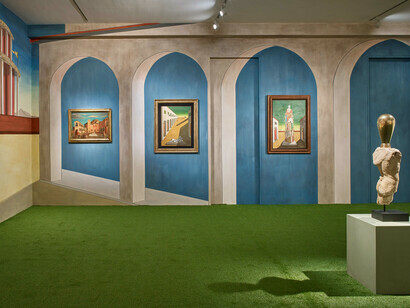 In the centre of the gallery, on the AstroTurfed floor, is Vezzoli’s Minima idea (Museo Dell’Antichità) (2014). Out of what appears to be an ancient Roman bust protrudes a featureless oval head in bronze, mimicking the featureless faces seen throughout the paintings of de Chirico’s metaphysical period. 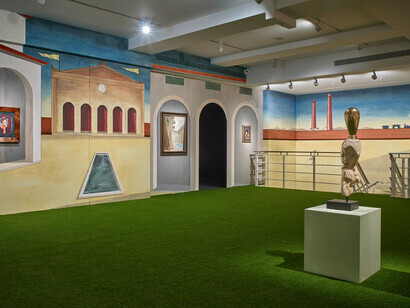 The surrounding gallery walls have been painted in a stylized panoramic version of de Chirico’s iconic motif of the Piazza d’Italia by Pettirosso Studio which, with the bust, activates the gallery as an immersive painting. In doing this, Vezzoli can be seen to be taking aim at the blurred lines between brand identity and stringent artist that has come to dominate the higher echelons of the art world. 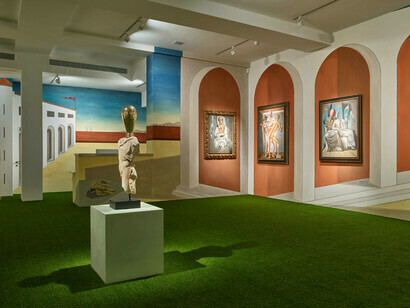 Vezzoli removes any dryness that is often derived from a purely academic survey – which can be seen Tornabuoni Art’s Reading de Chirico, currently on view at their London gallery, and instead, transposes it to a Las Vegas-esq self-wit – a bloated caricature of academic purity laden with novelty and spectacle that, once it has given way, provides a serious platform for de Chirico’s aesthetic legacy to re-examined through Vezzoli’s artistic concerns, namely, the seductive power of language and the instability of the human persona within celebrity driven culture. In two examples of early paintings, Homère (1925) and Gladiatori (1928), de Chirico’s brush work is agile and often applied in staccato-like flicks. In the case of the latter, he depicts a naked figure addressing two others. 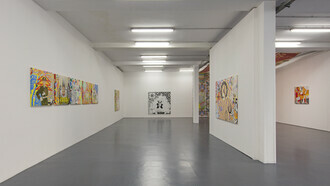 One is wearing a hat and mask; the other is, again, featureless like the sculpture in the centre of the gallery. 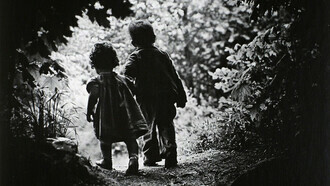 The main protagonist faces away from the viewer with his right leg outstretched to the right as he leans backs. Here, de Chirico’s brushwork of darkened orange is edged by flicks of white that give such life to the man’s toned back and animates his rippling leg muscles. In Autoritratto, accredited to the second half of the 1950’s, de Chirico paints a towering tree looming over a floor that has transformed into river. 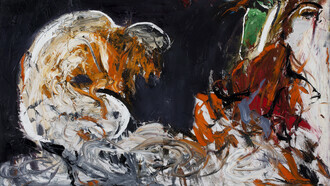 His brushwork is freer and more inclined to be read as a preparatory study than a finished painting, with sections of unpainted canvas aiding this. 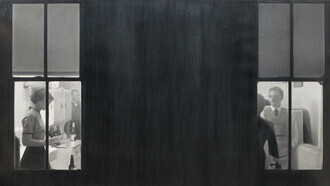 The work shows a shift in his pallet, which in this case, is muted and slightly washed out. 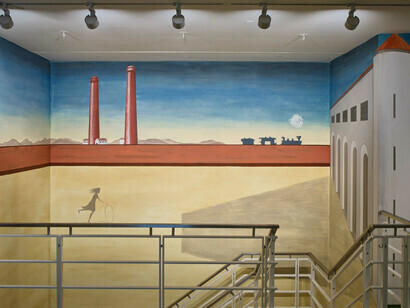 As a result, the image has the quality of trying to remember a particularly strange dream whereby the individual components oscillate in a holding ground in your mind as you try to re-piece together a concise narrative - much like the way Vezzoli has designed this de Chirico universe in order to re-examine de Chirico’s work. A series of archways painted on the wall as you enter the gallery house four works, three paintings by de Chirico, two metaphysical works that are immediately arresting with burnt umbers and dark green skies while the third, has a brighter, washed out collision of browns and blues in the same vein as Autoritratto are next to Vezzoli’s Portrait of Sophia Loren as Alcesti (After Giorgio de Chirico) (2017). The work is a colour portrait of Sophia Lauren with her with her head resting in her hand mimicking de Chirico’s Portrait of Alcesti (1918). Here, Vezzoli edits the image by stitching red tears so they stream down her face. To view these works collectively, immediately recalls a statue Vezzoli created in New Orleans in 2011 for Prospect.2 where, again, Sophia Loren was the model. 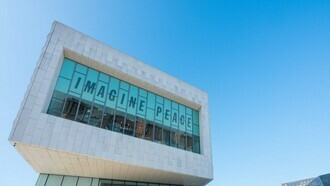 The surrealist-styled bronze statue was erected in Charles Moore’s Piazza d’Italia, itself a stylized architectural version of de Chirico’s Piazza d’Italia. 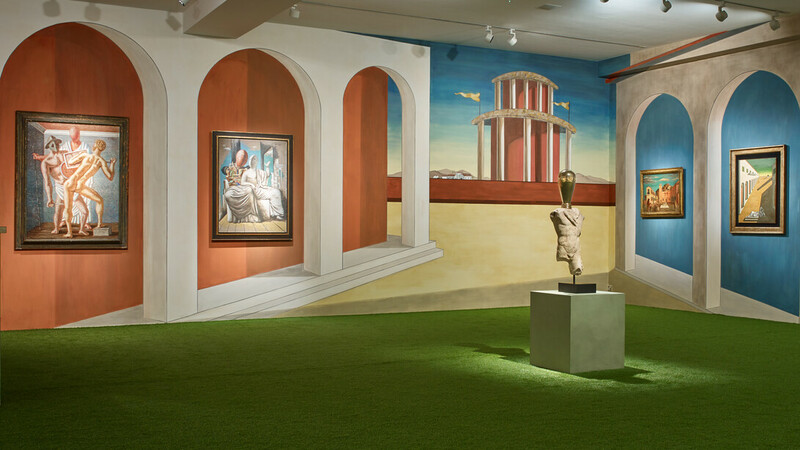 Both works flaunt Vezzoli’s use of clout in order to re-model aspects of de Chirico’s aesthetic sensibilities through his own artistic vision but brings to question, how objective is Vezzoli’s curation? 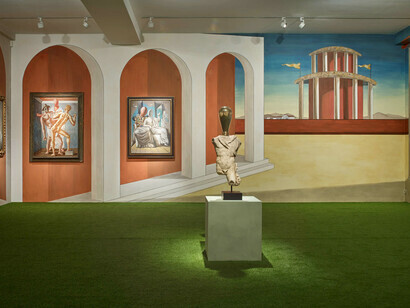 It is impossible to detract Vezzoli’s input and this gave the exhibition a compelling theatricality as Vezzoli’s role is revealed to be more and more like a puppeteer, manipulating how we embrace and interpret de Chirico’s work and legacy. As a result, he thrust a new spotlight upon him; de Chirico - de Chirico the brand; so that it’s possible to hear his name in the same vein as Hirst, Koons, and Murakami; to see his works as we see there’s now, created by teams in factories in a psudo-industrial manner, their names and works reproduced on luxury goods in limited editions to add artistic merit, as their works increasingly become greater and greater in scale outgrowing the confines of museums and galleries and commanding headlines when they sell for record breaking prices. This has the capacity to both sharply offend and be curiously flattering, if not, exciting, but with the click of the door behind you, you are reminded with a sudden jolt, that de Chirico is not.